CHROME Google’s browser comes with a built-in malware scanner. If you’re thinking about scanning for malware, chances are you’re either checking that your computer doesn’t have any issues that you don’t even know about, or looking to resolve a problem that you’ve discovered already. 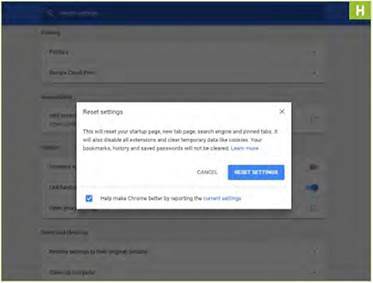 Hopefully, you haven’t got a big issue with your PC that prevents you from starting Chrome [Image A] in the first place, such as aggressive pop-ups. If you have, try scanning your PC with Windows Defender or a third-party antivirus/security suite. 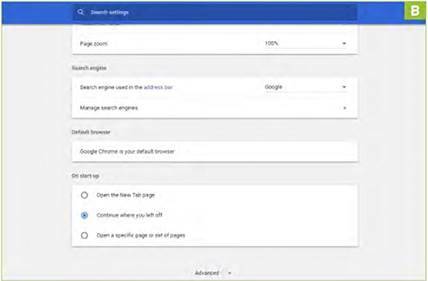 Click the three dots to the right of the address bar to go to Google Chrome’s main menu, then click the “Settings” option. Another way to access the same option is to type “chrome://settings” into the address bar. Once in Settings, scroll down to the bottom of the window, and click “Advanced” [Image B]. This will show you additional settings, including the one we need. 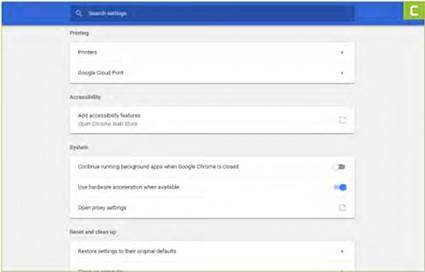 Again, you need to scroll right down to the bottom of the page that opens—this is where more complex features of Google Chrome are available, covering things such as printing and hardware acceleration. You should now see a panel called “Reset and clean up” (we’ll come to “Restore settings to their original defaults” shortly). 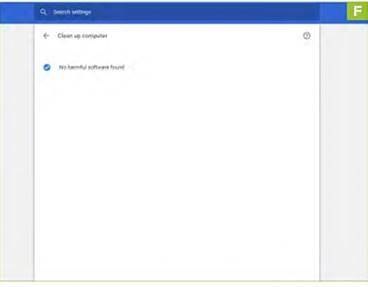 What we’re interested in for our current purposes is the “Clean up computer” option [Image C], so click that to get started. 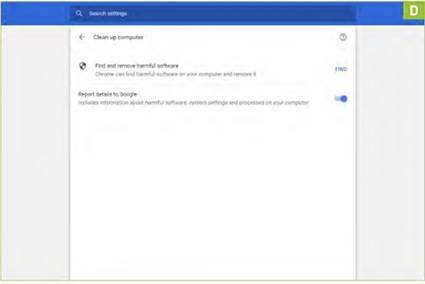 This simple page enables you to “Find and remove harmful software” [Image D], and it also gives you the option to share this information with Google, including details about your system and its settings, as well as any malware (if any) contained on it. Generally speaking, the information you share is used by Google to improve the software in the future. You can also access this page by typing “chrome://settings/cleanup” in Chrome’s address bar. 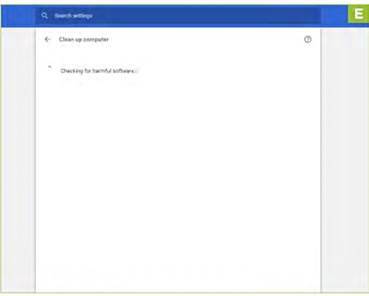 Now click the “Find” button—it’s the blue text on the right of the previous screen; it’s not that obvious a button, but Chrome matches Google’s styling cues, rather than those of Windows these days. You should then see a somewhat blank- looking screen as Google scans your PC for harmful software [Image E). It will only take a few minutes if you have a reasonably new PC, but it will take longer if your PC is getting a little long in the tooth, or contains a lot of files and apps. Most people then see a screen that announces that no harmful software has been detected on their PC [Image F]. Well done if you see this, because it means your PC is clean, and you’re probably very good at not clicking the wrong stuff—such as fishy email attachments, to name but one example. 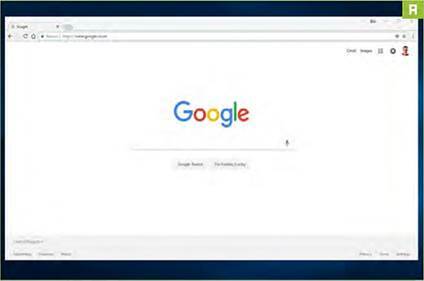 Now you are free to just browse to another webpage in the same tab, or close Chrome completely by closing the tab if you don’t need to do anything else online. If you haven’t been so lucky, you will see one of two messages [Image G]. 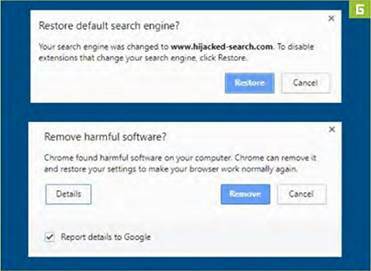 The main one is the bottom message, which is Chrome offering to remove harmful software. Click ‘’Remove,” then as soon as it’s done, we recommend running a scan with Windows Defender or a third-party antivirus suite. You might also be asked if you want to restore Chrome’s search engine option back to its default. Remember that “Restore settings to their original defaults” option we mentioned [Image H]? We recommend doing that if you’re still having issues with Chrome, even after the malware sweep. Note that doing so clears your cookies and extensions, as well as your browser settings, and homepage. It doesn’t remove any of your bookmarks, history, or saved passwords, though, so you’re safe there. Are you still running Windows 7 or Vista? Then we recommend you download Microsoft Security Essentials from here.